Happy Saturday everyone! This has been a busy week! 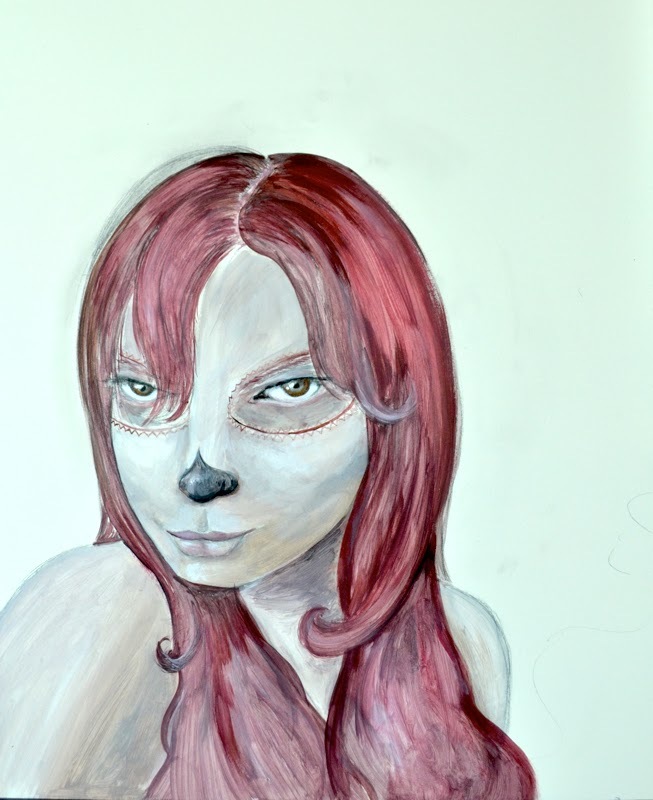 I want to share first off that I have had the honor of being interviewed over at ArtSeen! ArtSeen is a wonderful source of fine artist interviews online and a great inspiration to read. So many of my favorite surrealists have shared their stories there and I was so flattered to be asked to share mine- I hope you'll check out the interview! 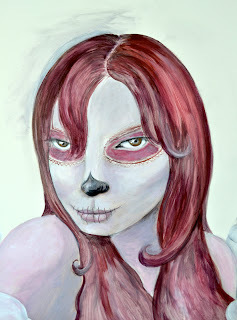 Every year I create some art to celebrate Dia de los Muertos, the Day of the Dead. When the Spaniards first came to what is now Mexico, they viewed rituals by the indigenous people that they believed were mocking the dead, but were indeed celebrating them- death and rebirth, and the native people believed the spirits of their ancestors would visit during this time when the veil was thinnest- similar to Pagan Samhain or All Hallow's Eve/All Soul's Day from Catholicism. From one of my favorite articles on the holiday, "life was a dream and only in death did they become truly awake." This year I have taken a photo of myself for reference. I am instilled with a new focus in the last week after some wrapping up with some personal and family business, and have never made a "self-portrait" piece of me as one of my ladies. So here goes. and I have obviously changed my hair and started plotting the makeup. That's about all for this peek at this piece... I will need to work on the background and get a few more pieces ready for my show next month- but you will see her soon! In other news, I have also newly listed some 12" record paintings to my Shop from my 2011 set for only 20 smackers, you can check them out here.